--Replacement Bands for Vivofit Jr.2 ,Also Perfect for Garmin Vivofit jr 2 and Vivofit Jr.
-100% Brand New, High Quality,Fits 4.7in~6.2in Wrists. --Made from Durable,Safe,low alergenic soft silicone materials, making them comfortable to wear. --This replacement bands are sweat,rain, splash and water resistant,intended for workouts. --Replacements for the Original Wristbands, great as a Spare, or even a gift. If for any reason you are unhappy with any product by RuenTech please feel free to contact us. We take full ownership and responsibility for the quality of our products and will do our very best to solve your problem quickly and efficiently! NEWEST COLORFUL Replacement Band for Garmin Vivofit Jr.2 ,Garmin Vivofit 3 and Vivofit Jr are compatible.Band activity tracker and comfortable wearing experience. 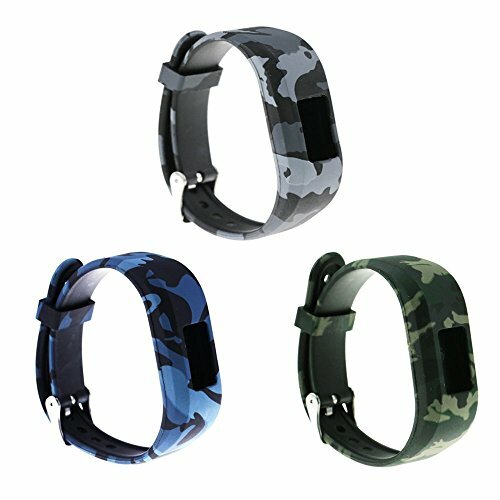 SMALL SIZE -- Adjustable bands fit wrists measuring 120-165 mm( 4.7~6.2inch)in circumference(not fit 8 years or older).with a buckle is recommended for small kids. SAFE MATERIAL--Soft Classic Silicone TPU + TPE Style Strap,durable and waterproof,which is very safe material and won't irritate your skin even when you sleep. 3 COLOR to replace..Multi colors available wristbands for your Vivofit Jr.2 to fit your mood and outfit in daily life at reasonable price. If you have any questions about this product by RuenTech, contact us by completing and submitting the form below. If you are looking for a specif part number, please include it with your message.